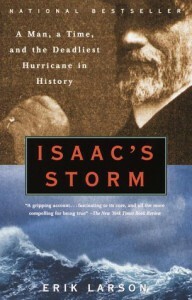 Isaac's Storm: A Man, a Time, and the Deadliest Hurricane in History - Erik Larson - review - "Check Six"
Doesn't that send a chill down your spine? The true story of the 1900 Galveston hurricane is told in the dramatic, gripping style I am coming to love. Erik Larsen's [b:Isaac's Storm: A Man, a Time, and the Deadliest Hurricane in History|239186|Isaac's Storm A Man, a Time, and the Deadliest Hurricane in History|Erik Larson|http://d.gr-assets.com/books/1320527478s/239186.jpg|1605] is superb. His description of the storm's progression and finally hitting Galveston is riveting. Having gone through a hurricane before, Larsen has convinced me not to tempt Mother Nature again.